[vc_row][vc_column][vc_column_text]We LOVE when our fabulous weddings are featured in bridal magazines. We feel very honored and proud to share our work with everyone. 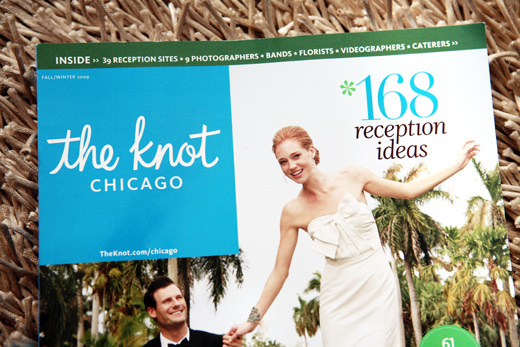 Please check out the latest in "The Knot Chicago" Fall/Winter 09 issue on newstands now. It is a wedding from a VERY fun couple, Natasha & Matt. Her dress was to die for and we LOVE the deep rich purple colors in her bouquet. So dreamy! Her theme was natural and organic. We used lots of natural elements, river rocks, blooming branches, white birch and bird motifs. One fun thing about the wedding was most of her bridal party lives in California and are choreographers. They surprised the bride and groom at the reception with a full on performance of Michael Jackson's Thriller dance - the original. It was amazing! We helped them rehearse in a secret location at the gorgeous Chicago History Museum.